We service and repair all major brands of appliances. Refrigerators, washers, dryers, and more. A premier provider of 24-hour emergency response, disaster restoration, and home cleaning services. We specialize in disaster planning, response and recovery. Offering complete design and installation on a large variety of fencing, including: Iron, Aluminum, Chain Link and Privacy Fence. Whether your home is dated and could benefit from a makeover or your family needs more space as it grows, you can count on us for all of your home remodeling needs. 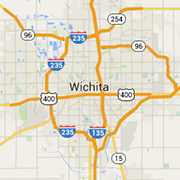 Providing the Wichita area with custom made windows, doors, roofing, siding, and sunrooms for over 15 years. Carpet and floors from around the world. A locally owned and operated painting company with over 20 years of experience specializing in interior and exterior painting for both commercial and residential properties. The nation's largest privately held wholesale distributor of plumbing, heating, and industrial supplies. Serving all of the Wichita area. Committed to providing prospective homeowners with a thorough and comprehensive home inspection. Carpet, upholstery, and floor cleaning for commercial and residential properties in Wichita and the surrounding areas. Service Disabled Veteran Owned. Home builders who build a relationship with you, the home buyer, giving you the quality you deserve. Providing lawn and tree care services, including fertilizing and core aeration, to the Wichita area since 1966. NorthStar Comfort Services is Wichita's premier insulation and window tinting company. Tree trimming, tree removal, stump grinding, brush/yard clean up, mowing, gutter cleaning, snow removal.